The heart is a muscular organ that pumps blood through the body’s network of veins and arteries, called the cardiovascular system. The average human heart beats 100,000 times in one day. Each beat is a muscle contraction pumping blood out to the body. Heart failure doesn’t mean the heart stopped functioning, but rather that the heart isn’t as strong as it should be. Heart failure, also known as congestive heart failure (CHF), can be chronic or acute. It occurs when the heart cannot pump enough blood to meet the body’s needs. Some medical conditions result in chronic heart failure. Coronary artery disease or high blood pressure gradually cause the heart to weaken, making it unable to pump blood efficiently. Other people are born with heart problems, which are identified as congenital heart disorders. About 5.7 million adults in the United States have heart failure. Heart failure costs the nation an estimated $30.7 billion each year. This total includes the cost of health care services, medications to treat heart failure, and missed days of work. Our doctors, clinicians and staff members are devoted to providing the best care possible, delivered with human touch. We are committed to treating each and every person we serve with dignity and respect. To schedule an appointment with a specialist of the Seton Heart Institute, please call toll-free 877-860-1141 or request an appointment online. Please click here for a list of insurances accepted by the Ascension Seton Heart Specialty Care & Transplant Center. There are steps that can help prevent heart failure from developing, like maintaining a healthy weight, leading an active, low-stress lifestyle and avoiding smoking cigarettes. Regular checkups and preventative screenings are also critical to maintaining heart health. If heart failure develops, it can be managed but not cured or reversed. Medication, changes in dietary habits or exercise levels, stress management and weight loss can all improve the quality of life for people with heart failure. 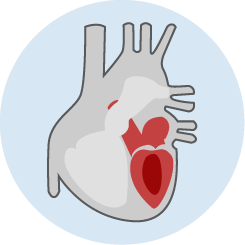 In some cases, a pacemaker or CRT device may be implanted in the chest to prevent heart failure by correcting an irregular heartbeat and stabilizing the heart rate. Blood tests to check your cholesterol levels, look for the presence of anemia and check your thyroid and kidney function. These can help indicate when heart failure develops or worsens. Chest X-ray for doctors to see the size of your heart, which shows if there is fluid around your heart and lungs. Electrocardiogram (ECG) results reveal if you’ve had a heart attack or if the heart muscle wall is enlarged, and check for abnormal heart rhythm. A stress test determines how well your heart responds to exercise. In this test, you walk on a treadmill or take medication to increase your heart rate. Your elevated heart rate is measured and results can indicate signs of heart failure. An echocardiogram uses sound waves that study the pumping action of your heart and show how thick the heart muscle is. Radionuclide ventriculography uses radioactive substances injected into the bloodstream to develop an image of the heart to reveal how well each chamber is working. The exam also looks for signs of damage from a heart attack. Because heart failure is considered a chronic heart condition that needs management throughout your lifetime, there are many different treatment options. Carefully managing heart failure can help your heart grow stronger again. Sometimes, heart failure that’s caused by an underlying condition can be treated by addressing that concern instead. For example, heart valve disease is a risk factor for heart failure, but replacing faulty valve may prevent heart failure from occurring. The most common way to treat heart failure is with a combination of different medications. These include drugs that control blood pressure, improve blood flow, correct an irregular heartbeat and help your heart have to work less hard. Some medications, like beta blockers, can help reverse damage after heart failure. Surgical procedures are also used to treat heart failure, sometimes to address a risk factor contributing to heart failure, as in the case of a bypass being performed due to blocked arteries. Heart surgery can also be performed to insert a pacemaker or cardiac resynchronization therapy (CRT) device. Both devices stabilize the heartbeat and prevent heart failure. Other less common surgeries for heart failure include heart valve surgery and heart transplant surgery. Aftercare depends on type of heart surgery received. Patients with a pacemaker or CRT device can expect to stay overnight in the hospital with their heart rate monitored. They may experience pain and tenderness at the site of the implant for up to several weeks. Most patients can resume normal activities several days after surgery. Recovery time for heart valve surgery or bypass surgery can range from four to 12 weeks. The length and quality of recovery varies from person to person. Patients may experience pain, swelling or fatigue. Individuals will gradually resume normal activities over the course of several months. Heart transplant patients face a long recovery. One to two weeks are spent in the hospital. Careful monitoring continues for three or more months after the transplant. After heart failure or surgical treatment for heart failure, cardiac rehabilitation programs are often recommended to help patients recover and care for their heart health.